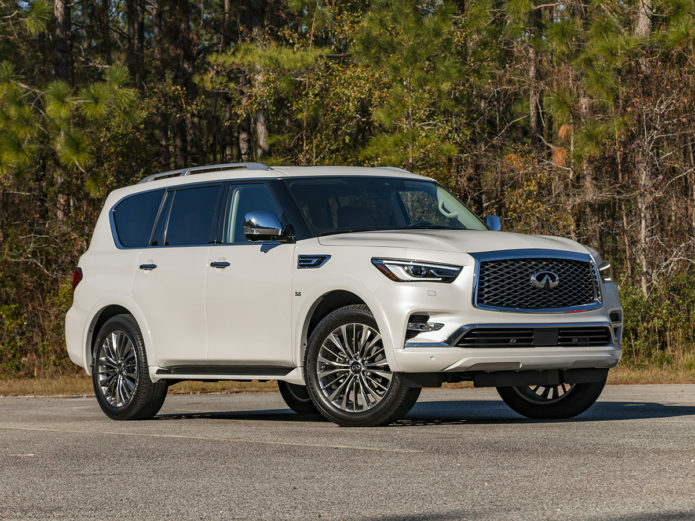 I’m not kidding (okay, I’m sort of kidding) when I say that the Infiniti QX80(starting at $64,750) is only slightly smaller than a studio apartment I used to live in. It’s a very large SUV that’s packed to the gills with luxury features. It’s certainly nicer than my old home. And, with room for eight, it has more seating, too. But like my old abode, it’s not exactly on the cutting edge of technology. Sure, it’s filled with modern touches you would expect from a luxury SUV, but the QX80 is in a weird spot right now. 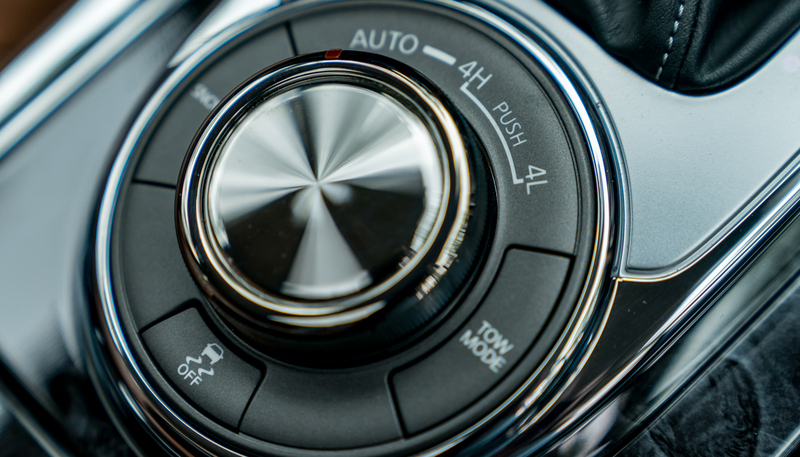 With parent company Nissan introducing its impressive semi-autonomous driving system ProPilot Assist to the Infiniti Q50 sedan and CarPlay making its way into Nissans, the QX80 feels left behind. A luxurious large SUV that offers a smooth ride in a package the size of a small apartment. The engine offers more than adequate power but also burns through gasoline quicker than a 747. Sadly, some of Nissan and Infiniti’s best tech hasn’t made it to the QX80. As people generally opt for larger cars and SUVs, the luxury SUV is edging out the high-end sedan as the opulent vehicle of choice. Typically, these lavish cars are where the latest tech lands first. If you’re paying a premium, your entire experience should be premium — from the wood paneling and smooth-as-butter ride, to the latest semi-autonomous features and infotainment system. Unfortunately, that’s not always the case. 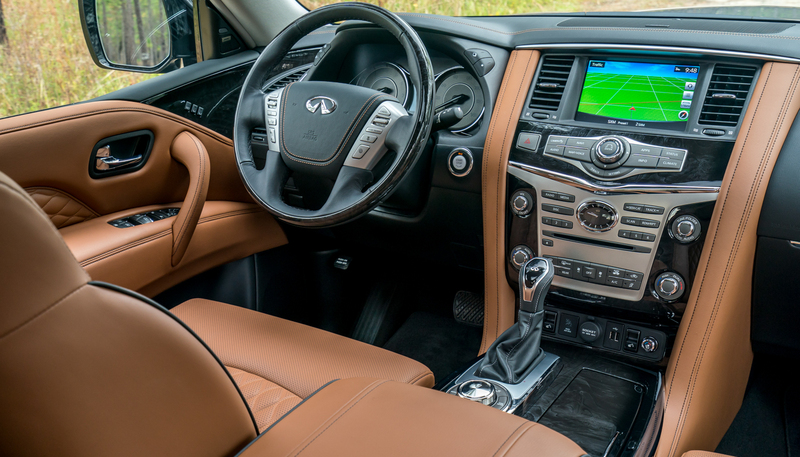 Sitting in the QX80, you lord over other passenger vehicles. It’s a comfortable throne with access to the vehicle’s 400 horsepower and 413 pounds of torque. All that power is derived from the 5.6-liter V8. It would be an impressively huge engine in a smaller SUV. In the case of the all-wheel drive model I tested, the engine pushes nearly six tons of car. It easily caught up with traffic, had no problems overtaking other vehicles and made quick work of hill climbs. But that power comes at a high price. The QX80 is rated at just 13 miles per gallon in the city and 19 on the highway. During my drives, I averaged 16.4 miles per gallon. That’s with hundreds of miles of highway driving. Not that this should be a surprise for anyone in the market for an SUV this size. Folks who actually buy large SUVs seem happy to trade efficiency for opulence, and the QX80 is indeed ready to pamper. All of the seats are unconditionally comfortable. The rear seats in particular are equipped with headrest displays and wireless headphones so that passengers can enjoy a show or movie while ignoring the driver (aka mom or dad). As those children grow, there’s plenty of legroom for rear passengers. If you’re a giant like myself, the third-row seating will suffice for quick jaunts. But for anything longer than a few minutes, the cramped accommodations will quickly wear on passengers. If there’s any quibble with the luxury of the QX80’s interior it’s the lack of massage chairs. If you’re going after the Cadillac Escalade, you need to at least have the option of massaging seats. Nothing says extravagance like having your back rubbed by a car while you’re cruising down the freeway at 80 miles per hour. Driving the SUV (without being massaged I might add), I was able to handle corners as well you would expect with a vehicle this large. 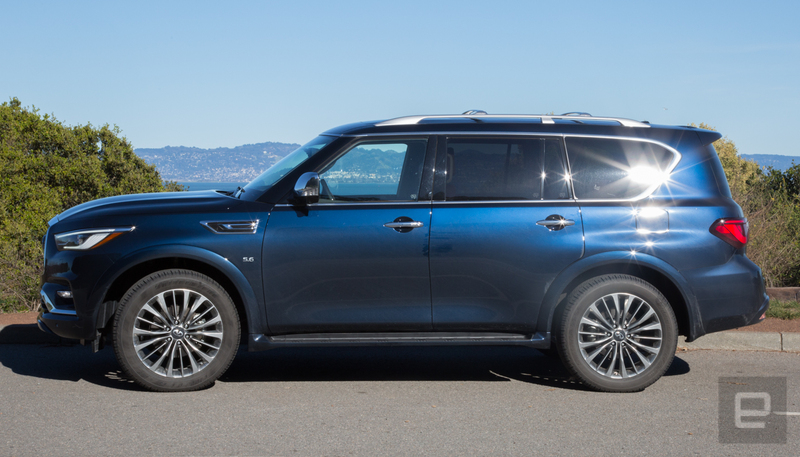 The QX80 has Hydraulic Body Motion Control that’s supposed to reduce body lean and smooth out the ride. Frankly, it was tough to know how well that worked on corners, but the ride was floating on a cloud. 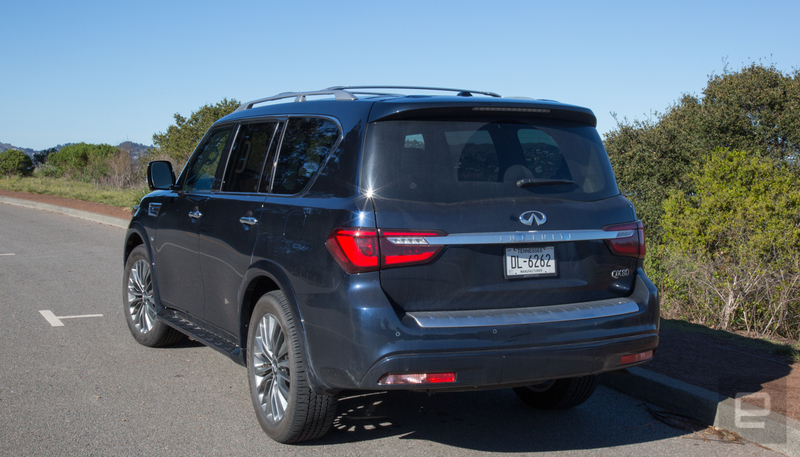 It wasn’t just on the freeway and paved roads where the QX80 felt like it was floating. I had the opportunity to actually take it off-road into mud and on back roads where the potholes outnumbered the flat areas. Sure, the QX80 is made for cruising in town, but it’s just as comfortable spitting mud out of the tires and navigating around ruts. 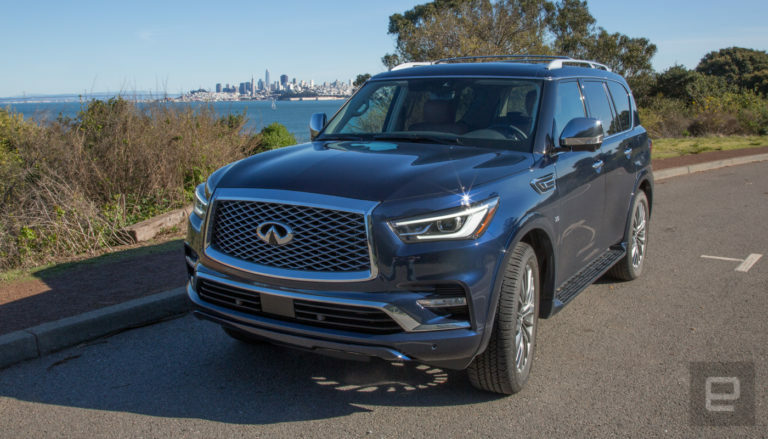 But, while it’s comfortable, luxurious and able to tackle actual off-road environments, the QX80 is still devoid of any truly cutting-edge tech. And some of the features it does offer have issues. The adaptive cruise-control system on two occasions warned me that the front-facing radar was obstructed. That meant no more cruise control (which is a huge bummer when you’re super tense and could use a back massage). I would have understood if this happened in the mud, but both times it happened I was driving in rain. The lack of Android Auto or CarPlay is also disappointing. It’s getting tougher to excuse cars — especially luxury vehicles — that don’t support these systems. Especially since Infiniti tweeted back in 2017 that CarPlay was coming. The standard infotainment system isn’t horrible, but it doesn’t live up to the rest of the vehicle. Another feature that’s hopefully coming is Nissan’s ProPilot Assist. This impressive semi-autonomous system is available on the Leaf, Rogue and the 2019 QX50. Fingers crossed that the QX80 is on the shortlist of vehicles getting the technology during the next refresh. We’re also hoping the upcoming variable compression engine will eventually make its way to the QX80. Long story short, the technology adjusts how the engine runs and could lower consumption during highway driving while still offering low-end torque for overtaking other cars on the freeway. In the meantime, the QX80 has made a nice place for itself in the very large luxury SUV market. It doesn’t have the latest tech (which is disappointing) and sometimes the tech it does have fails at weird times. But, if you just want to feel fancy while lording over the peons in their sedans and compact SUVs (scoff) and if you can deal with spending a large chunk of your paycheck on gas each week, you’ll feel at home. Just know you’ll have to get your back massage elsewhere.